You can learn how to perfect the timing of your life, says a life coach. 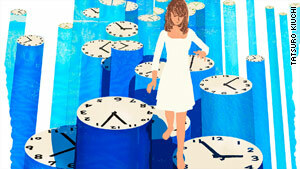 Expert believes our "highly sophisticated instincts to help us navigate time"
(OPRAH.com) -- My timing stinks!" my friend Jackie moaned. "I always do the right thing at the wrong time." It did look that way. Jackie snagged a job in banking just before the recent recession hit. Terrified she'd be fired, she worked like a mule and earned brilliant performance ratings -- just before the bank failed. Jackie was jobless in the worst economic crisis since the Great Depression. She was greatly depressed. Meanwhile, Jackie's cubicle buddy Cleo threw a party to celebrate her own layoff. "Everyone had been predicting the collapse, so in the past few months I'd been checking out other options," Cleo told me. "My cousin runs a medical clinic in rural Nepal, and I'd always wanted to volunteer there. Now I have a severance package and a clear calendar. The timing's perfect!" There have been many times in my life (the accidental pregnancy, the chronic illness, the water-heater explosion that flooded my house on the day my real estate agent showed it to prospective buyers) when I wanted to personally cane anyone who trumpeted, "The timing's perfect!" If that were true, would scientists ever have invented Cialis, much less had to warn men about that scary four-hour maximum? I think not. Nevertheless, I'm mellowing toward the "timing is perfect!" constituency. I've come to believe we humans possess highly sophisticated instincts to help us navigate time. Tune in to these signals, and it really does seem that everything's on schedule. Tune out, and it will appear as if you're at the none-too-tender mercy of blind luck, as poor Jackie was. Oprah.com: Do you have good timing? Take the quiz! One of the things that changed my mind about timing was the recent book "How We Decide," by Jonah Lehrer. The calculating part of the human brain, Lehrer writes, "is like a computer operating system that was rushed to market." It's slow, clunky, prone to errors -- at least compared with the brain region associated with emotions. This highly developed area "has been exquisitely refined by evolution...so it can make fast decisions based on very little information." For example, a baseball batter doesn't have time to think about the trajectory of a pitched ball. His swing is based on subtle clues gleaned from the pitcher's windup. He experiences this information not as thought ("This one's high and inside") but as feeling ("Danger! No!"). As Lehrer puts it, "Every feeling is really a summary of data, a visceral response to all of the information that can't be accessed directly." Your nonverbal brain, then, is continuously registering incredibly subtle predictive clues. It communicates with your consciousness through emotions and hunches, making you uneasy when you procrastinate too long or commit too quickly. It can speed you up with anxiety or excitement, slow you down with fatigue and confusion, or help you feel balanced and relaxed. Oprah.com: What is your body trying to tell you? I've found that the people I work with in my life-coaching practice possess instinctive timekeepers holding detailed plans for their futures -- and that these plans often go totally unrecognized by my clients. The process on the next page is astonishingly accurate at surfacing these subconscious schedules. 1. Enlist a friend to be your truth-tester. 2. Think of something that isn't happening for you as rapidly as you'd like: finding a soul mate, getting pregnant, mastering macramé. We'll call this Event X. 3. Hold your arm out parallel to the floor. Have your friend press down on your hand while you try your hardest to keep the arm horizontal. 5. Retest your strength while saying, "Event X will occur within my lifetime." If your arm strength dissolves, you probably harbor a deep belief that X is impossible. If your arm remains strong, you believe X will happen. Now find out when. 6. Retest your strength as you say, "X will happen within 20 years." If your arm weakens, test again with later dates: "X will happen within 30 years" (or 40 or 50). If your arm is strong on the 20-year test, start working backward --"X will happen within ten years," "X will happen within five years," etc. 7. Eventually, your arm will go from strong to weak. If you're strong on "X will happen within four years" but weak on "X will happen within three years," your internal timekeeper expects X to happen in about four years. I want to be clear: This test doesn't predict the future. It simply shows what you expect to happen. But expectations are incredibly powerful. The mind often creates what it believes -- especially if the belief is unconscious. That's not to suggest that these buried plans are immutable. If this test reveals you're unwittingly delaying something you really want, hire a shrink, unstack your mental blocks, and change your subconscious schedule. Most "timing's perfect!" enthusiasts don't need these kinds of tests. They're constantly aware of their internal timekeepers, respecting information and intimations, preparing to avoid danger or pursue opportunity. By contrast, people who bewail their bad timing often ignore, even actively reject, facts and premonitions that could help them better plan their actions. True, everyone is subject to good and bad events. But the laws of probability mean that extreme strokes of fortune, positive or negative, occur rarely and end quickly. If you ask people (as I often do) how they make decisions, "lucky" people will talk about tuning in to information and instincts, while "unlucky" people often mention pushing away the uncomfortable feeling they were headed for trouble. Jackie and Cleo are classic examples. They both knew that their industry was in trouble, and they both had strong hunches that they'd be laid off. Jackie reacted by clinging ever more tightly to her doomed job; Cleo started planning a different life. Each woman sensed the ship was sinking, but Jackie lashed herself to the mast and frantically swabbed the deck, while Cleo calmly launched a lifeboat. So how do you tune in to your timekeeping impulses? Ironically, the only way to access your inner guide about the future is to fully occupy the present. By noticing everything you're feeling -- physically, emotionally, and intuitively -- in any given moment, you maximize your awareness of the "exquisitely refined" nonverbal timekeeper nudging your noggin. 1. Take a relaxed breath and exhale fully. Before inhaling again, rest in the pause between breaths. Focus on your heartbeat and the pulse in your hands, feet, and scalp. As you return to breathing normally, remain aware of your pulse throughout your body. This anchors you in the present and keeps you calm during the next steps. 2. Acknowledge that you can't change anything that's already happened. Sometimes that's a shame, but it's just plain true. 3. Accept that many things about the future are unknowable and beyond your control. Scary? Oh, yes -- but again: true. 4. Recognize whatever's happening right now (you'd be amazed how often we try to deny what's going on). If the present is miserable, this step can hurt --but not nearly as much as living with the consequences of denial. 5. Pull an Eckhart Tolle: Shrink the focus of your attention to this present moment. Are you going through a divorce, bankruptcy, or similarly difficult experience? Maybe -- but right now, you're just reading this. Be here now. When you plan, plan here now. Don't preemptively grapple with circumstances that don't yet exist. Living this moment in peace, tuned in to your inner timekeeper, will lay the groundwork for the best possible future. 6. Go back to sensing your pulse throughout your body (this returns you to a peaceful place if you've been unsettled), and ask yourself what you feel you should do about each situation in your life. As you begin articulating what you know or suspect about the right course of action, your body will relax. Even if things look scary, accepting the truth brings peace. 7. Follow through on any ideas you've had about preparing for your optimal future. 8. Stay alert to new hunches, and change plans accordingly. The more often you follow these steps, the more your life will seem blessed by good luck. You'll realize you're a walking gold mine of subconscious predictive information. The more you test the validity of that information by acting on your instincts, the more accurate your predictions will become. Research shows that making and correcting missteps is the best way to develop any skill. And anticipating circumstances that might change, to avoid potential problems and seize opportunities, is very much a skill. As you pay attention to your internal timekeeper and learn from your mistakes, you may eventually hear yourself rhapsodizing, "The timing's perfect!" That's what happened to Jackie. She spent weeks after her layoff applying for similar jobs, knowing all the while that there were none to be had. One day she finally admitted what she didn't want to know she knew: Her current job-seeking strategy was hopeless. Acknowledging this made Jackie feel oddly peaceful (since she'd known it all along). She also felt a deep sense that she'd be fine, if not in exactly the way she might have expected. Jackie decided to trust that hunch -- not because she believed it but because it felt marginally better than panic. A few days later, Jackie ran into a high school friend, Steve, a criminal defense lawyer whose practice was booming. Steve was looking for someone with financial savvy to be his CFO. Jackie's training wasn't quite on target, but they had such a pleasant conversation (partly because of Jackie's newfound mellowness) that they agreed she'd try filling the spot for a week. That week ended up lasting indefinitely. Jackie loves her new job and appreciates that the less daunting hours mean she can live as well as work. This has improved her relationships with her husband, her two children, and her own instinctive timekeeping self. Sometimes she e-mails Cleo (who's loving Nepal) about the "amazing luck" they both had just when things looked grim. Since they're on opposite sides of the world, one usually e-mails while the other's sleeping. But they don't mind. They just keep learning new ways to make the timing perfect.